Ziggy is now back home at the Mystic Aquarium in Connecticut. 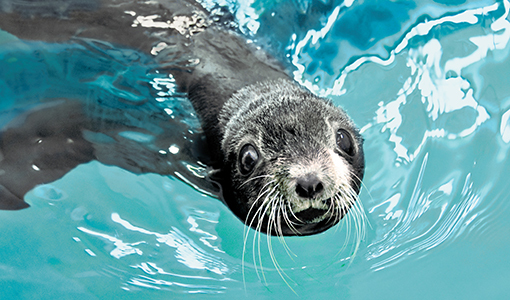 Five years ago, after a Northern fur seal was found stranded on the California coast and deemed nonreleasable by the federal government, Mystic Aquarium in Connecticut gave her a home. The fur seal, named Ziggy Star, initially had manageable neurologic abnormalities, but her condition declined by late 2017, and she began experiencing cluster seizures. When Ziggy’s caregivers brought her to the Henry and Lois Foster Hospital for Small Animals, an MRI revealed hydrocephalus, an accumulation of cerebral spinal fluid in the skull. “Her brain tissue was disappearing due to the pressure from the excess fluid,” said neurosurgeon Ane Uriarte. The best option to stop further deterioration—and improve Ziggy’s quality of life—was to surgically place a shunt, a device to drain fluid. The November 2017 brain surgery was the first of its kind performed on a fur seal. To prepare, the Cummings School and Mystic Aquarium teams worked together closely, comparing best practices and challenges unique to pinnipeds, such as seals, sea lions, and walruses. Because a marine mammal’s unique dive physiology can lead to health risks related to anesthesia, a veterinary anesthesiologist specializing in these animals was brought in. The team also clipped as little fur as possible so Ziggy could properly regulate her temperature and used special sutures and surgical glue to allow a quick return to water.